Iyengar Yoga is a thorough and in depth system of yoga that gives accurate and anatomically correct guidance on how to practise the Asanas (postures) in such a way as to receive the maximum benefit physically, mentally and spiritually. The way it is taught develops and stretches not only the body of the practitioner but also his/her intelligence and understanding of yoga. Through the use of props, one of the distinguishing characteristics of Iyengar Yoga, the practitioner is able to create alignment and opening and become more sensitive to what is happening not only with the external body but also the internal body during a posture. The props provide a way of opening physically and energetically without the disadvantage of strain caused by restriction or limitation, which may be present if practising unsupported. The strength, stamina and refinement that is cultivated through this system of Yoga has an effect that reaches beyond the practice and transfers into every aspect of life. 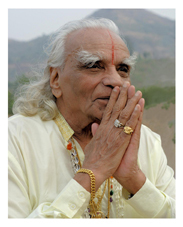 Iyengar Yoga may appear to focus on the physical aspect, but it is through the Asanas and the way in which they are approached that the philosophy of yoga is imparted to the practitioner. I have found that the benefits and understanding I have gained through Isabelle’s classes spread beyond my yoga practice into other areas of my life. As a person I am more tolerant, calm, patient, self reliant and happier. As you can tell, I can’t recommend her Yoga classes too highly. They have changed my life – they could change yours!